My fascination for oysters didn’t kick in until I moved to Hatteras Island. Starting out, times were tough financially, but it was a worthwhile tradeoff for the experiences in store for me. 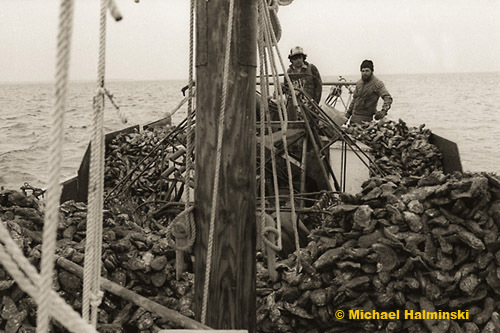 Back then you could walk the shore of the Pamlico Sound and get all the oysters you wanted for great meal. I remember picking them with Larry Midgett and some of the other locals, and it became one of my favorite things to do. 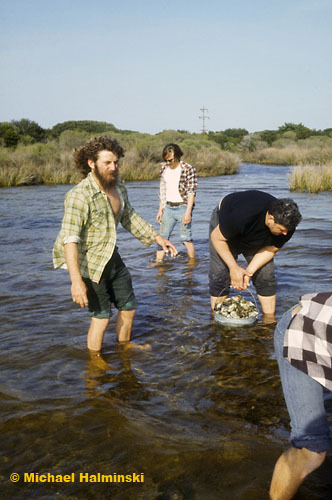 Larry Midgett, Tim Merritt and “Big Leroy” picking some oysters in a creek in 1974. Today this creek on Hatteras Island doesn’t produce much anymore. In the early 80’s, I began going to Easton, MD to participate in a photography exhibit at the popular Waterfowl Festival. During the show in 1981, an acquaintance that I knew through surfing the Delaware shore told me that he was dredging oysters on the Chesapeake Bay Skipjack, Stanley Norman. He invited me out for a sail, so once the festival was over, I took Trent Palmer up on his offer. The wind was light, and so was the oyster catching, but I knew right then that I wanted to spend some more time photographing the only commercial fishing boats in the United States still using sail power. The next day, I returned to Hatteras to resume my life there, still thinking about the skipjacks. 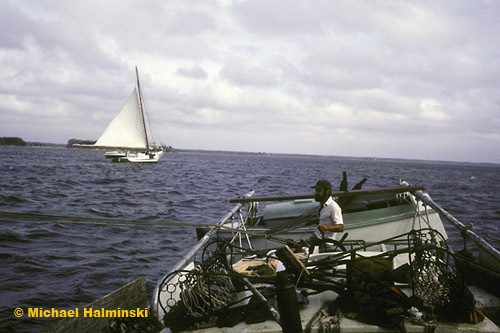 Trent Palmer out on the bowsprit of Stanley Norman furling the jib in November of 1981. Later that winter, Trent told me about a couple of boats that had openings for crew members. So I drove to Tilghman Island to see about working on a Chesapeake Bay Skipjack. My intention as a budding photographer was to shoot some of these historical workboats under sail. The only way I could do so, was to seek employment to pay my way. I was a little nervous at first, but once I stepped aboard the Virginia W in the predawn hours, I met Tim Stearns, the owner and captain of the 1902 built skipjack. He didn’t fit the mold of what I expected from a typical sea captain. From the very beginning, he was welcoming, kind, didn’t shout at the crew, and we became very good friends. I was also impressed that this young man of small stature had bought this rotten, derelict boat, and restored it nearly singlehandedly in about a years time. 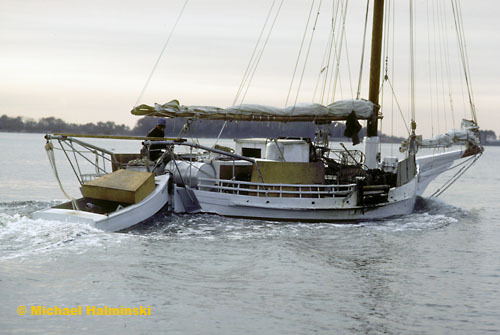 It became a very seaworthy workboat and had a new life once again. 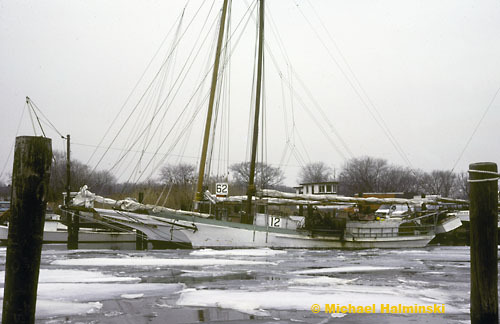 Virginia W in port at Tilghman Island rafted up to the Anna McGarvey as ice flows through Knapps Narrows. According to records at the Chesapeake Bay Maritime Museum, she was built in Oriole, Maryland in 1902, and is 44 feet in length. Captain Tim Stearns is at the helm of Virginia W near the mouth of the Choptank River. Me the “greenhorn” after a good day of working a muddy bottom. Tim asked me to hand him my camera to take this shot. Then I reciprocated and took his picture amid 120 bushels of oysters. 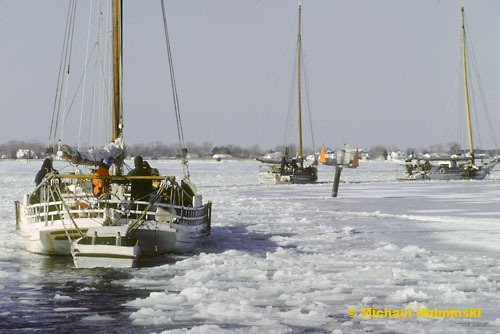 We had a good hard working crew, and I dredged aboard Virginia W for the better part of 2 winters, always with my waterproof Nikonos camera close by to catch those magnificent boats sailing by. With the Chesapeake Bay Bridge behind us, I jumped out on the bowsprit of the Virginia W to make this photograph while we sailed into Annapolis. We spent the night on board there with 100 bushels on deck. Leigh Hunteman handles the bow line of Virginia W to shovel out at the dock on Tilghman Island. Leigh later became the only female captain of a skipjack by running the Sigsbee. The Stanley Norman was built in Salisbury, MD in 1902 and is 47 feet long at the waterline. 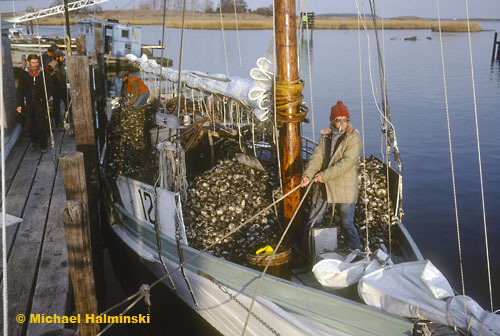 Here owner/captain Ed Farley steers her over an oyster bed. Sigsbee at 47 feet was built at Deal Island in 1901. 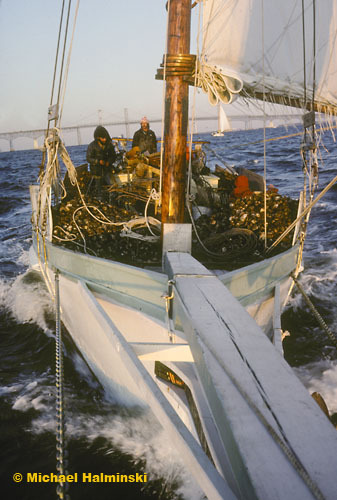 Here she pulls dredges under full sail, with Captain Wade Murphy at the helm. 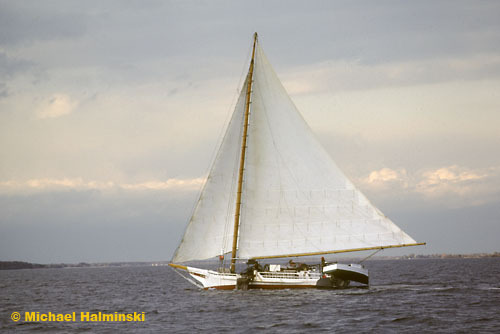 The skipjack Kathryn at 50 feet, was built in Crisfield, Maryland in 1901. 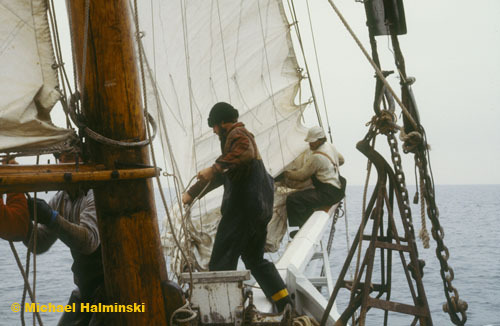 Her bottom is planked fore and aft with rounded chines, rather than the typical herring bone, hard chined bottoms of most skipjacks. 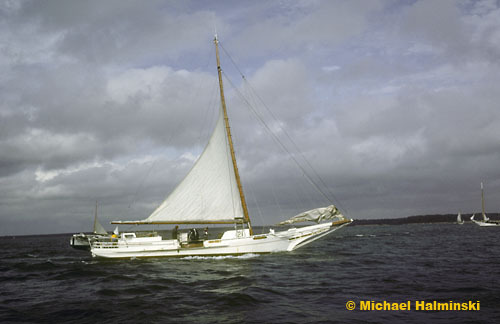 Here she flies by us pulling both dredges, 4 reefs in the mainsail, with captain and owner Russell Dize at the helm. After a day out on the water, Captain Darryl Larrimore guides the 42 foot Claude W. Somers back to port powered by the yawl boat. She was built in 1911. 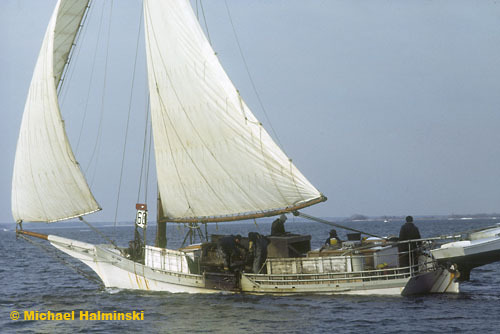 Part of the history of this skipjack is tragic. In 1977, she went to the bottom in a storm near Crisfield, taking all of the 6 crew with her. This stern view shows the Kathryn as she follows a path cut by a state ice-breaker in order to get back to port. The temperature was 10 degrees and the ice a foot thick. My feet were still cold despite felt-lined work boots and 2 pair of socks. This was one of the last days of my experience on Chesapeake Bay Skipjacks. Thus ended my career as an oysterman. 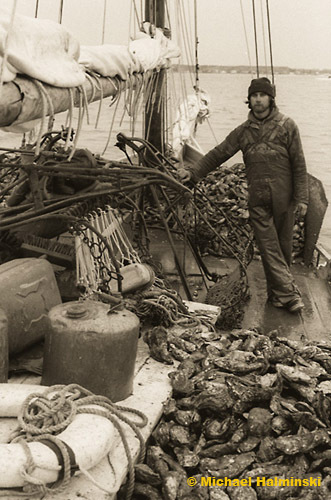 This entry was posted in commercial fishing, boat, pamilco sound, gillnetting, oysters, People, Sea, Weather on June 21, 2009 by j0jgvm89bj.